" Never underestimate the power of a chilled almond tofu." 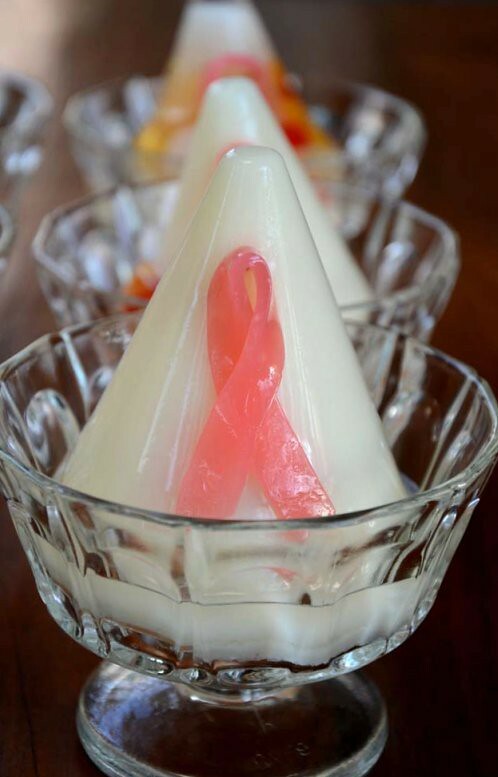 Pink Ribbon Almond Jelly: Refreshing, silky and soft almond tofu with a center of fruit cocktail, decorated with a Pink Ribbon. Now I know why yesterday's ginger jelly wouldn't set. And why my guava sherbet wasn't every smooth. I thought it was because I didn't use an ice cream maker. It's because the enzymes in ginger, papayas, kiwifruit, pineapple, figs and even guava can break the protein bonds in gelatine, agar etc, preventing them from setting. You can read all about it here. Almond tofu (xingren doufu in Chinese) isn't really made of almond and tofu. When you buy almond tofu mix in a box,the 'almond' powder is really the grounded apricots seeds and if, I'm not wrong, those seeds are the ones used in cooking Chinese watercress soup. 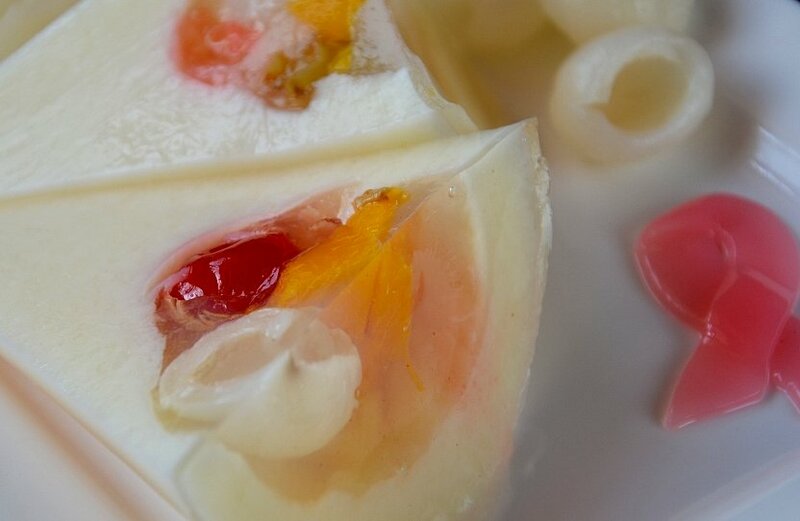 There's no tofu either but the combination of agar (a gelling agent commonly used in Asia), evaporated milk, water and almond essence results in a silky soft 'jelly' that's similar doufu hua, a Chinese tofu dessert. I know that almond tofu is too common a dessert but there's a reason why it is one of the top favorite Chinese dessert in Hong Kong, Taiwan, Southern China, Singapore and Malaysia. Besides being very refreshing and delicious, almond tofu is usually served at wedding banquets because the word for almond in Mandarin Chinese is xingren which also sounds like 'newly weds'. There may be other reasons but I'm not recollecting them right now. I read that the Japanese love this dessert (annin tofu) and the Koreans too. I've never made almond tofu so I turned to the Net but couldn't find any recipes that had spoon measurements. I prefer using measuring spoons than whole envelopes of prepared gelatin powder or leaves because the Nick Munro moulds hold are small--only 200 ml capacity each--and I'm too lazy to convert the proportions of ingredients from grams. Okay, the truth is I didn't have a weighing scale that could weigh lower than 10 grams until last week and it is too much hassle to use it compared to a measuring spoon. I don't like the taste of any ready mix so I had to make the jelly from scratch. I finally found a recipe using measuring spoons here. Roses's recipes are just like mine, true and tried at home. A thing about Rose that is quite poignant is that she started her blog to share her recipes after recovering from breast cancer 7 years ago. I've adapted Rose's recipe to suit my cooking and the Jellirific! mould by reducing the sugar and adding a bit of dairy cream because I wanted a more opaque-looking jelly. From Day 1 of the Jelliriffic Challenge, I wanted to make a Pink Ribbon jelly but had no idea how to do it. One day while I was driving, I suddenly got it. It turned out to be so simple. Just make 'ribbons' out of konyakku because that's a very stretchable, almost elastic gelling agent. You might think that almond tofu is too everyday ordinary and that fruit cocktail is so...traditional. 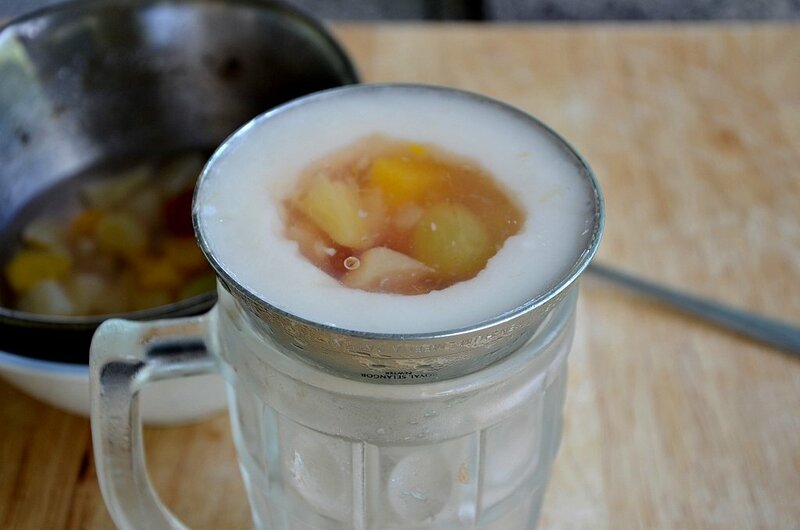 Somehow almond tofu only goes with mushy fruits such as canned longans and fruit cocktail. 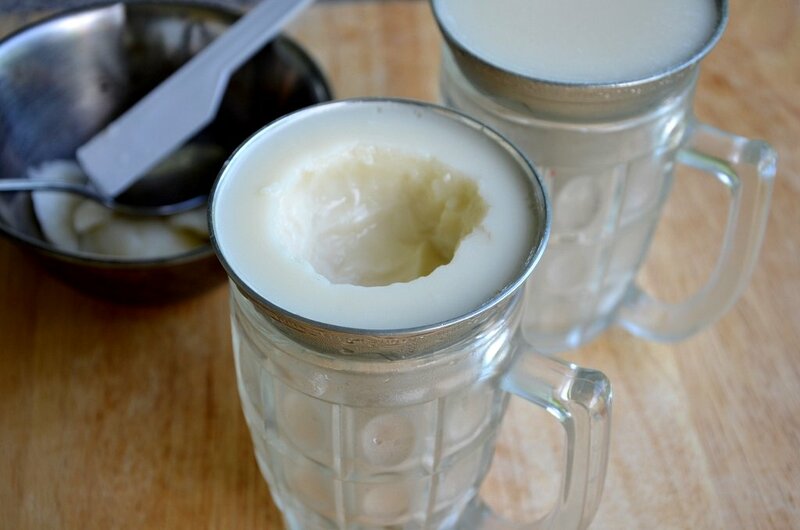 Listen, make one, chill it very well and be surprised by how refreshing and yummy it is. 1. Scatter the konyakku powder over the water in a small pot and cook, stirring, until the powder is dissolved. Add the citric acid and coloring. Stir well and pour into a flat rectangular pan to get a thin piece of jelly. 2. Using a sharp knife, cut the jelly into very narrow strips (3/4 cm) and into suitable lengths. Make one ribbon to see how long you like it to be. If the ribbons are thin, they stick to the jelly (wipe the part of the jelly where ribbon will be placed) but don't look as realistic as thicker ribbons which have to be hung on a toothpick. 1. Mix the agar powder with the sugar. Put the water into a small pot and scatter th agar over the water, stirring well. Heat and stir until the agar and sugar are dissolved. Remove from the heat and add the evaporated milk and cream. When cool, pour into the Nick Munro moulds. Chill until set. 2. Scoop the agar from the center of the set jelly to make a well. 1. Mix the konaykku powder with the sugar. Put the water into a small pot and scatter the powder over, stirring well. Heat and stir until sugar and konyakku powder are dissolved. Add the citric acid, stir well. Cool. 2. Pour the konyakku jelly into the well of the almond jelly, adding the fruit cocktail as you pour. Pour in stages so that the fruit cocktail will not float. Chill until set. 3. Turn the jellies out onto a serving plate. Stick a short piece of toothpick into the jelly and hang a strip of ribbon on it. Cross the ribbon to make a 'Pink Ribbon' and use another toothpick to make the cross stay. Serve very cold with more fruit cocktail and longans. Pink Ribbon Almond Tofu 2 continues tomorrow. If I m not asleep b4 12., I can't wait to check ur blog out. I think u hv just convinced me to buy those jelly moulds. Can imagine all the jellies At Kay's birthday parties. This is really beautiful!! I love almond tofu, a lovely dessert! I wish you would post not right before midnight because i almost always check it out at almost 11:30 pm before i sleep. Otherwise got to wait early in the morning. I love this post, reminds me of the aids cause. your creativity knows no bounds!! 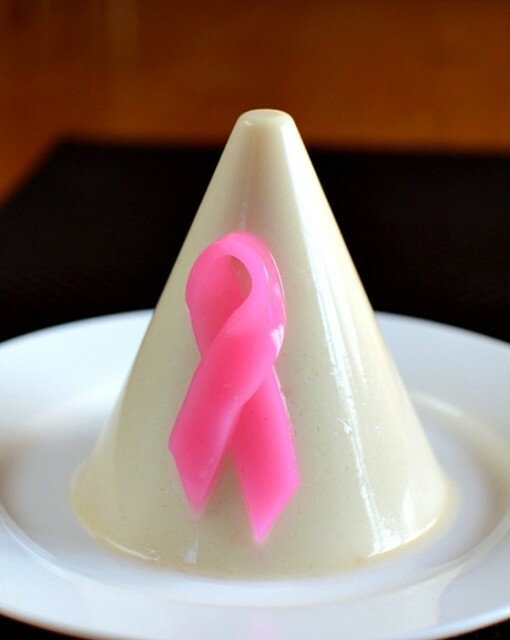 this delicious dessert should be served at a Breast Cancer Awareness Fundraiser! Kudos to your effort Terri!! I realy like the ribbons, very cute! Oh dear..the ribbon look so lovely ..Good work!! Love all your jellies. They are so beautiful! Terri, this is so sweet and creative. Also the previous sakura one was so pretty and classy. You are so creative. I've looked at the other entries and I can say this for sure - you will win this, Terri, hands down. Your jellies are much more creative, elegant, sweet, pretty, classy, delicate and has more finesse than the rest. They are fine dining standards. I must say the designer of the jelly mould, Munro, was it? is a genius. It is such a unique beautiful elegant mould and sort of shape of a ... ahem, woman's breast?! Is that what it is supposed to be since it's about breast cancer?! Time flies,you are half way there, it's the 15th day of the competition already and you continue to amaze me everyday with your creativity! terri, you are so good. My family not only like your creation but the education part as well. Looking forward to your next creation. Everyday you are impress us with creative and lovely jelly, another 15 posts to go, keep it up and looking more creation from you. 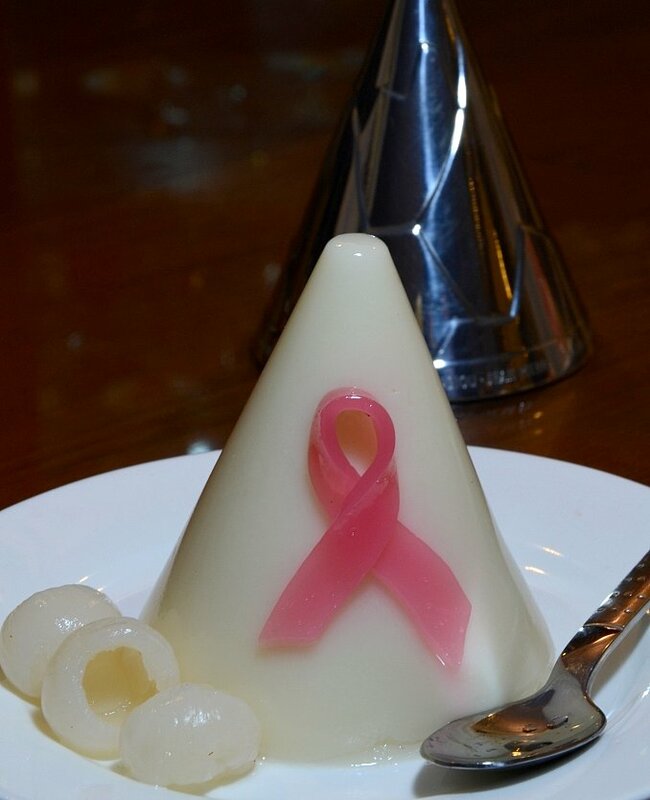 And I think it's great that you are paying tribute to the campaign by making a Pink Ribbon jelly. This is my top favourite! It really embodies what the whole pink ribbon thing is about. Brilliant!